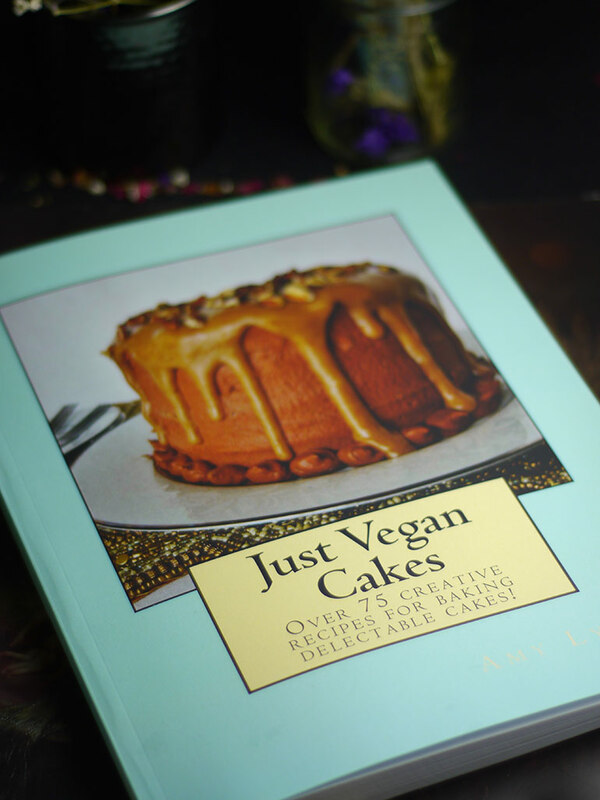 When my blogging pal Amy from Fragrant Vanilla Cake self-published her new cookbook Just Vegan Cakes and asked me if I wanted a copy to check out… of course the answer was YES! 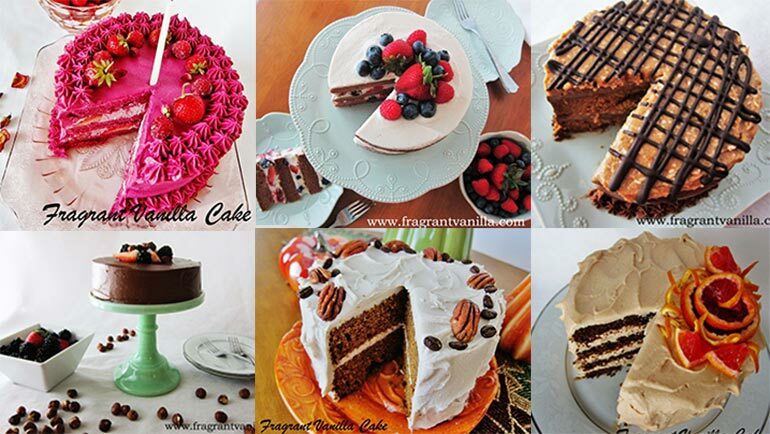 75 recipes of cake. Of every kind. And all cake I can eat… No brainer! I’ve always loved Amy’s creativity and delicious recipes. There’s a strange pull between our blogs. Our recipes and style are somewhat different, yet our tastes and sense of adventure in the kitchen seem to be aligned so often. Something akin to fraternal baking twins… In any event, her *unmistakably Amy* cakes always catch my attention. So having 75 new ones all at once to check out was a lot of fun. First, 2 words about this book and recipes. This isn’t Amy’s first book. If your curious, you can find her earlier books here. This book is just about cakes. 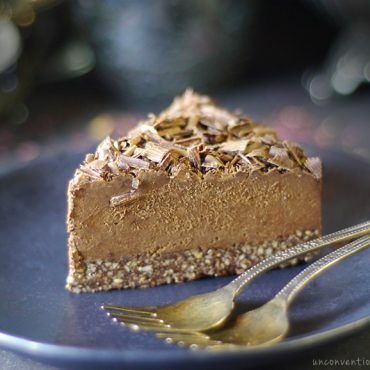 Raw cakes, pound cakes, layer cakes, upside down cakes, crepe cakes, coffee cakes, bundt cakes, cupcakes, cheesecakes, ice cream cakes, mug cakes… in short, enough cakes to keep you happily busy baking a good while ?. 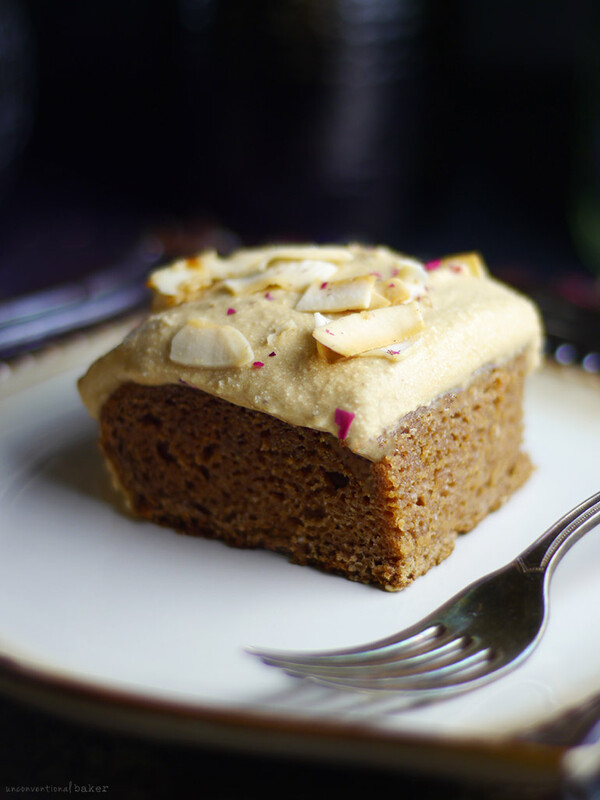 And while the book is called Just Vegan Cakes, besides being naturally eggless and dairy-free, all of the recipes are also gluten-free and refined sugar free, too. It was so hard to pick just one cake from the book to share with you — I wanted to do so many! 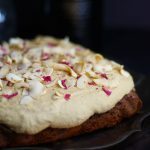 But I’ve been wanting to make a tres leches cake for the blog for some time, so figured rather than re-invent the wheel why not share Amy’s take on it. It turned out quite lovely, and the cake base was so easy to work with and versatile — you could really use it for so many different variations of layer cakes, loaves, and so on. Also, it just so happened that I picked the worst day of the year to bake and take photos of this cake — we had an intense heat spell and that day was particularly crazy. But when I’m busy “caking” I don’t generally notice these things… that is until my husband comes in to give me the look for running the oven in the middle of a heat wave ?. Reason I’m sharing this is that my frosting was getting soft-ish while taking photos. But don’t judge the book by my melty “cover” of the recipe. It was utterly delicious from top to bottom. I could eat that whipped frosting with a spoon and be a happy camper! I know you’ll love it too — melty frosting or proper (though now that you’ve got my warning, I’m sure you’ll know better than to bake cakes and then take lengthy photoshoots of them during a heat wave ;) ?). In short, if you like this cake or just cake in general, check out Amy’s book and blog to support her recipes and creativity! And if you’re not in need of cake at the moment, may I recommend Amy’s incredible ice cream gallery… ? Lush vegan version of “three milks” cake aka Tres Leches Cake, topped with billowy dairy-free whipped cream. 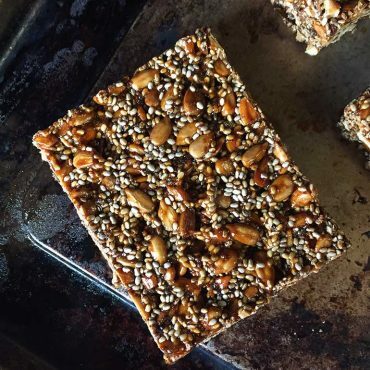 Gluten-free and made without refined sugar. ¼ cup + 2 tbsp coconut milk at room temp. Preheat oven to 375F and position rack in center of oven. Line an 8×8 inch cake pan with parchment paper. Coat parchment paper and pan sides lightly with oil. Whisk dry ingredients together in a large bowl to blend well. Whisk wet ingredients (except cider vinegar) together in small bowl to blend well, then whisk into the flour mixture until well blended. Whisk in the cider vinegar. Transfer cake batter to prepared pan and bake until tester inserted into center comes out clean, about 35-40 minutes. Cool cake completely in pan on rack, about 1 hour. Turn cake out onto platter, peel off parchment paper. Whisk together the soaking syrup ingredients, and then brush over top of cake. For the frosting, combine all ingredients in a high speed blender and blend until smooth. Pour into a bowl, and place in the freezer for about 30-45 minutes (whisking every 15) until it thickens to the consistency of thick whipped cream. 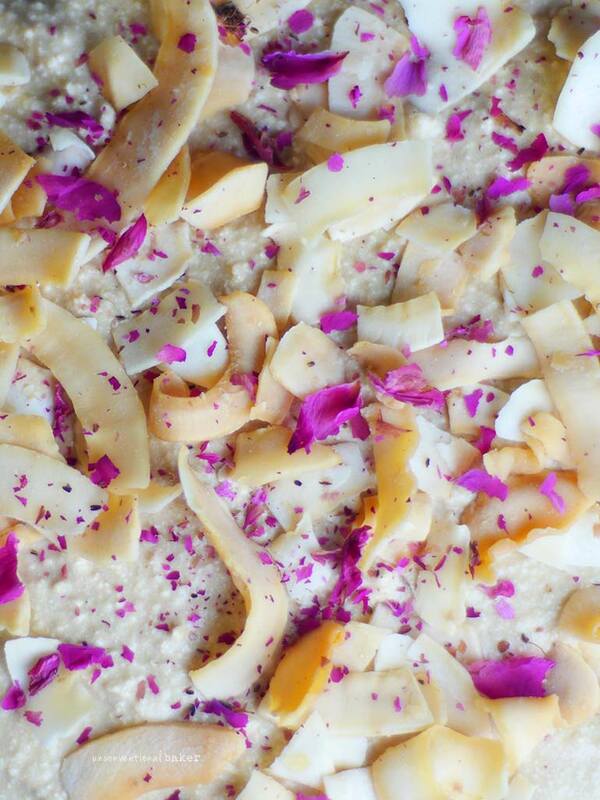 Spread the frosting over cake, then top with large flake coconut (and rose petals, if using). 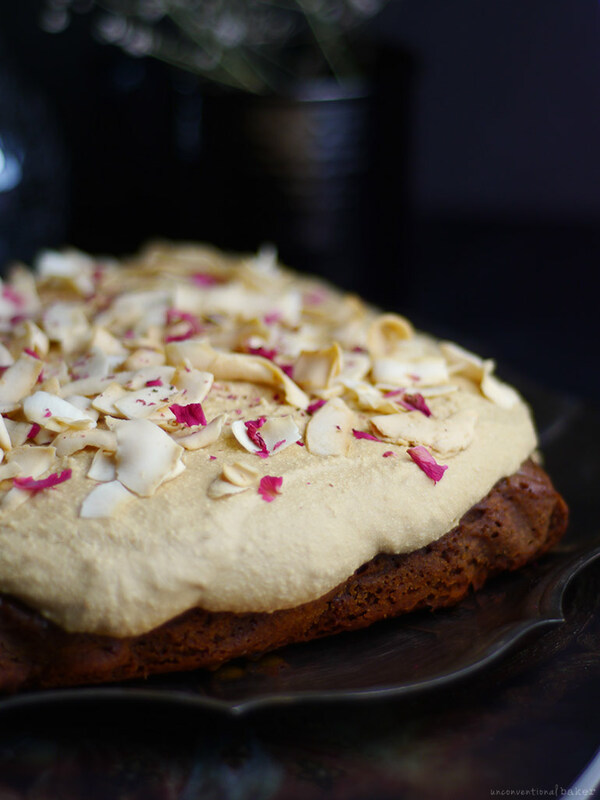 Disclaimer: this post contains affiliate links to the Just Vegan Cakes book and rose petals. I’m looking for a dairy-free tres leches cake to make for my husband’s birthday (it’s his favorite!) and this looks incredible! Would it work just as well to make it with regular flour, rather than gluten-free? Thanks! I suppose you can try adding it to the frosting instead of the sweetener and some of the coconut milk. Or just drizzle it on top of the cake altogether in place of the frosting. Oops! One more question: About the soaking syrup, is 3 Tablespoons of syrup really enough for the whole cake? Other tres leches cake recipes seem to have about a cup or more of soaking liquid. Thanks again! Hey Jill. I actually found it to be a lot of syrup! I had so much I didn’t know what to do with it :) I just followed Amy’s recipe exactly as she outlined in her book and there was definitely enough syrup to soak the whole cake. I made the cake, and it was super-delicious!!! Everybody raved about it. I followed the recipe. I refrigerated the frosting, but not the cake, and frosted it the day of the party. I used toasted small flake coconut on top and surrounded the cake with nasturtium flowers. Just one thing: The recipe calls for 1 can chilled full fat coconut milk for the frosting. (I used Trader Joe’s organic.) It never firmed up. So I made another batch and drained the liquid from the can, and then it firmed up perfectly. Thanks Audrey and Amy! Hey Jill. Thanks so much for sharing how it went. So happy it worked out well! I sort of agree about the frosting come to think of it. I used one a can that had more cream in it, and felt like it could have been a bit firmer maybe for next time, so draining the water makes sense as you described. It was still fluffy and delicious so I didn’t mind :) but maybe for a frosted birthday cake, etc. a firmer frosting would work best. Thanks for this recipe! I’ll be making it for a special occasion. So I just want to check with you to be sure: There is no flax egg or egg replacer in the recipe. Is it correct that it doesn’t need it? Also, what’s the best way to store it overnight. Would it be best to frost it the day of serving? Thanks! You could refrigerate it overnight, and frost the day of. You could also frost in advance if you prefer, but I feel like frosting the day of would probably work best. It looks gorgeous Audrey!! I definitely need to try this one next. I love Amy’s book so far, I mean hello, cake is my favorite thing ever, haha! I’m posting this week on her book as well! So much yumminess. You did a wonderful review of her book and recipe! Thanks Brandi :) I loved this cake. Can’t wait to see what you picked to try out! Oh, wonderful — so happy you liked it, Sarah! :) We loved it too. Hi Angela, you could just make fresh coconut whip cream instead of the topping if you prefer — that doesn’t require coconut butter (just the white cream part from a chilled can of coconut whipped + a few tbsp sweetener and vanilla). Or you can make your own coconut butter by processing shredded coconut for about 10-20 minutes in a food processor until it reaches coconut butter consistency. Ok, you totally cracked me up with the dating site ? I’ve been seeing so many tres leches cakes on pinterest these last few months. I’ve never tried one before but it looked and sounded great. Amy’s version is delicious! Thank you so much for reviewing my book Audrey, and your version of the cake looks wonderful :)! Thanks Amy — it’s been a pleasure to explore it!